Sometimes I have a bit of an obsessive nature. I wish I could easily apply this to my exercise regime, but unfortunately, the point of fixation is quite random. When I was at the peak of my own personal fitness, I would run seven times a week (four times by myself, three times with the husband who was still a beginner) and do a couple of BodyCombat and BodyPump classes a week. Okay, so I was no Paula Radcliffe, but for someone who comes from a 'large' family (small family, large people) it was really quite an achievement when the husband took some photos of me before a charity run and declared I was looking 'quite skeletal'. In fact I still weighed 10st something, but when you've weighed 16st something, it's a fixation that's paid off. I think it's that obsessive fixation that's had me religiously keep this blog up for 97 consecutive days and making it to post 100 (I've double-blogged on three occasions). If you've been following me on this journey, you will know that I've been fixated by certain books - notably Thomasina Miers' Easy Mexican Food and Dan Lepard's Short and Sweet. My latest fixation is Lorraine Pascale. Why the new fixation? Well I got Home Cooking Made Easy for Christmas and it reminded me that I'd barely touched Baking Made Easy so now seemed like the ideal time to get on with it. I have given myself until today to do the unhealthy recipe thing and from tomorrow, I'll be blogging about my attempt to improve the quality of my diet and shift a pound or 14 as I get back towards being a better runner in time for the Bath Half. Today's recipe of choice was Les Petits Croquembouches from Baking Made Easy. 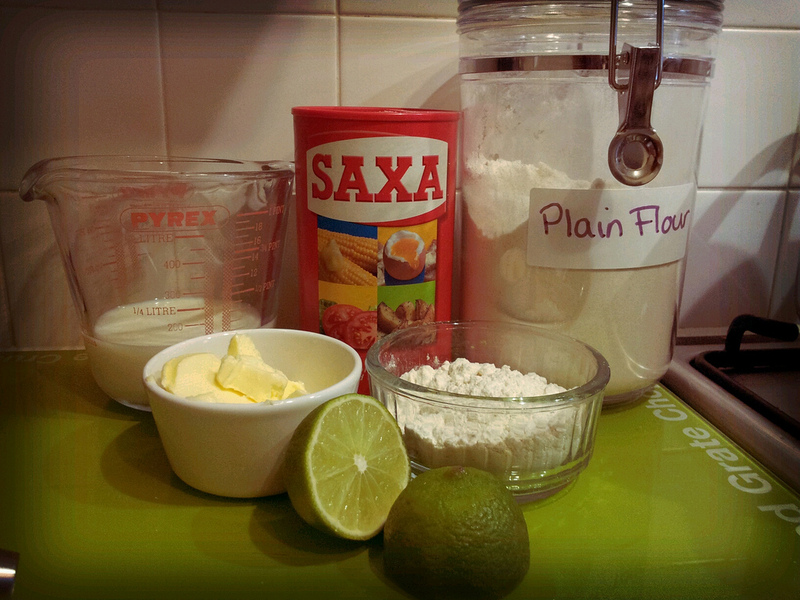 You may remember I was going to do a Croquembouche for Boxing Day, but for one reason or another, it never happened. So as a 'treat' to myself, I went for Pascale's 'Petit' version this evening as was just me and the husband dining, as is traditional. 'Croques' have fascinated me since I was a child and had to find one to tick off in my Usbourne Spotters Guide to France. While I was typing this, I just had to Google the availability of this little gem of a book. Sadly, they don't publish them for countries any more (or at least as far as I can see) which is an absolute travesty. Now how am I supposed to entertain my daughter when we go to France when she's older?? Anyway, back to Lorraine and her 'Croque'. Like any good recipe, it is open to adaptation. Pascale presents her 'Croques' by piling coffee-cream in the middle of the plate and just building the choux buns in a pyramid around this. Maybe that's why she classes it as easy? As far as I know, traditional 'Croques' are constructed from creme patisserie filled buns (I double checked myself on the Interweb, and Wikipedia agrees, so it must be true). With half a litre of double cream still in the fridge, I decided to fill mine with sweet vanilla whipped cream, decorate it traditionally with the spun caramel and then serve a little pot of chocolate sauce on the side for my uber fussy husband. 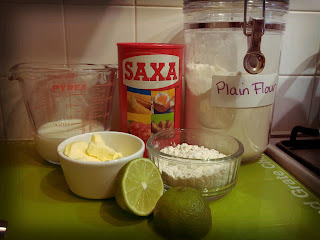 I do love the idea of the coffee cream, but want to start the New Year on a good footing (2011 hasn't been the easiest of years for us) so didn't want to do anything too way out! 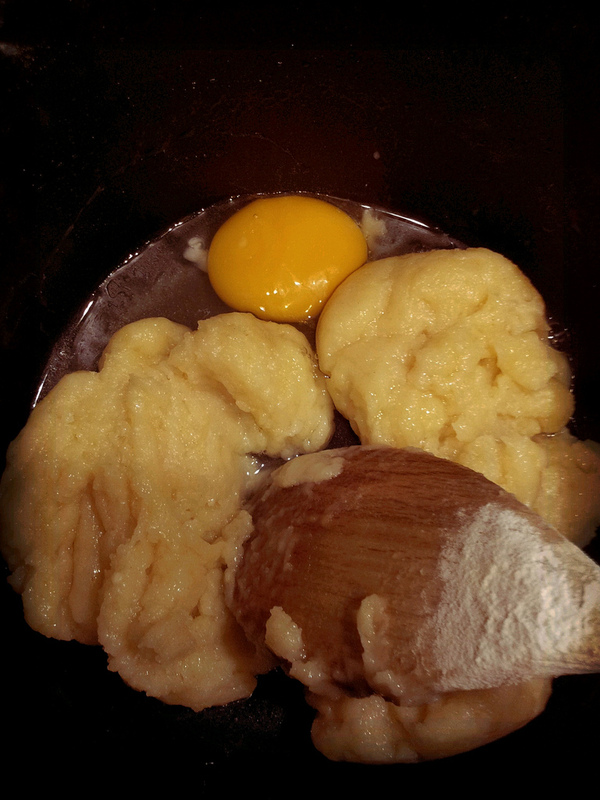 Anyhow, the choux recipe and the spun sugar instructions are pretty simple and very well detailed. 'Croques' are notoriously hard to construct if you're doing the full on pyramid version as there's a lot of hand-dipping of individual choux buns in hot caramel which I'm sure would lead to burnt fingers and more than a few expletives. There is an alternative recipe on BBC Good Food where the tower is constructed using white chocolate as the 'glue' which might be something I'll try another day if I ever have the confidence to go for the full-on version. 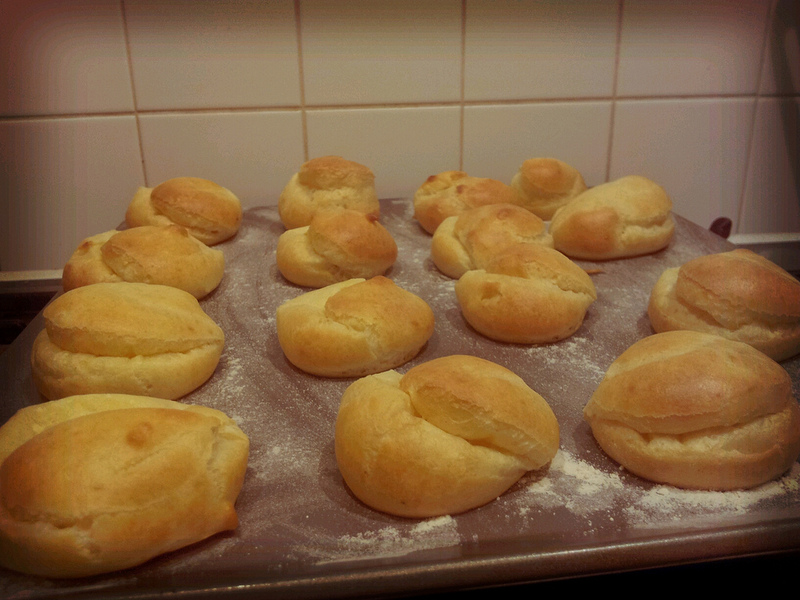 This one has Limoncello cream filled buns. Nom, nom, nom!! 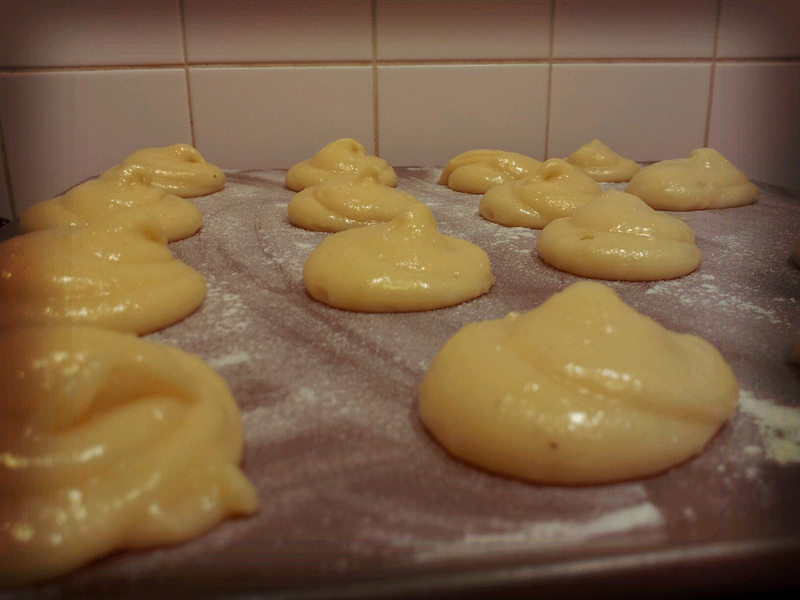 My buns rose well but lost their puff when I took them out of the oven the first time. Despite having had the full cooking time, I think they probably could've done with a little longer. It may also be due to me having used spreadable butter because *shock horror* I'd run out of real butter so maybe the oil in the Lurpak had something to do with it. 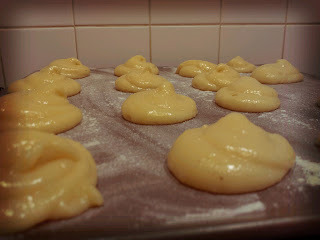 I dried them out and piped them full of softly whipped vanilla cream which helped to make them look less flat again. With an awful lot of cream to spare (Pascale doesn't fill hers with cream, I did and I still had a pile left over) I also piped cream in to the middle of my croque to hold it together rather than using the caramel to 'glue' them in to place. I thought that the caramel would never ever get to the correct temperature. 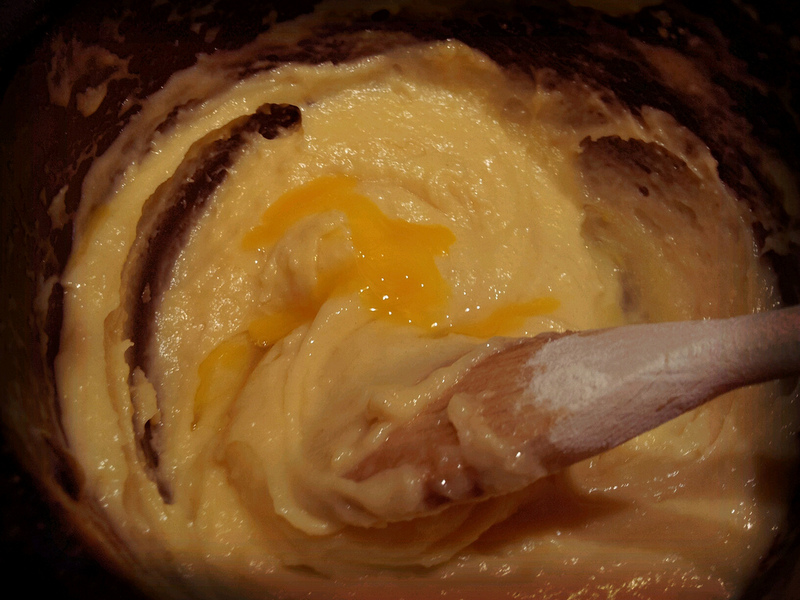 It took about twenty minutes in all from mixing the sugar and water to it turning the required honeycomb colour. Pascale doesn't offer thermometer temperatures, but I guessed I was after 'hard crack'. My Heston thermometer didn't want to know about this - I don't think I had enough syrup in the pan for it to work as it says the probe must be submurged by at least 2cm and not touching the bottom of the pan. 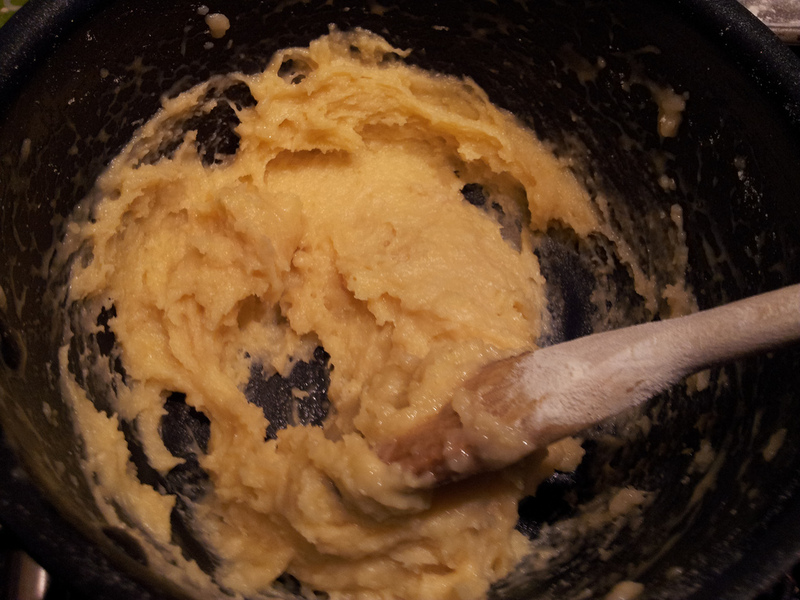 As for the recipe, I'm a bit disappointed with the picture in the book because I only got 14 and a half buns from my choux. Maybe I made mine a little too big? Pascale recommends circles 2cm x 3cm (that's a circle? I'm sure circles were perfectly round when I was at school). It's really hard to tell from the accompanying picture in the book just how big they are when they've puffed after cooking as there's nothing in the picture to give you any perspective so they could be miniscule or they could be the same size as mine. Once it was the correct colour, I plunged it (as advised) into a saute pan of cold water to stop it cooking further and burning. I did the twiddly thing, took a few pics and then had the husband ask me where my pudding was (seven puffs each wasn't enough - until he started eating it!). That bit was pretty easy but then came the cleaning of the pan. Pascale fails to mention that you'll be left with solid caramel in the bottom of your pan once you're done. Nor does she tell you how to resolve this issue. Thankfully a quick Google mentioned adding water to the pan and gently warming it. The caramel cracked and came away in such huge amber-coloured chunks that I half expected to see Dickie Attenborough in my kitchen looking for pre-historic mosquitoes to turn into dinosaurs. I then snuck outside and poured the rest of the hot caramel into the outside drain rather than plugging up my kitchen sink! All in all an entertaining day. I didn't like that the choux buns were quite so soft and small (it made them hard to fill, but maybe that's why Pascale doesn't fill hers). Personally I'd've liked them a little crispier, but my discerning (read fussy) husband really liked them. I think if I was going for a full on three-foot high construction, then bigger and a bit crispier would be necessary or you'd need an awful lot of buns to get that kind of height. 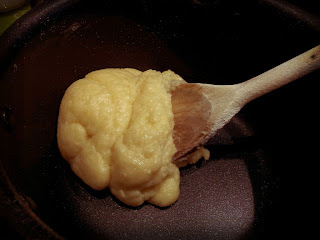 I may try another choux recipe if I made it again. Will definitely find an occasion for a really big tower and really want to try the Limoncello cream idea.